Ah good ole OKC, a city that has a great culture, commerce, and some great sports. The Crystal Bridge located at the Myriad Botanical Gardens serves as its landmark and each city quadrant has its own park, so you can really tell that they know how to do green here. With so much greenery to be found in OKC, we at Lawn Love would like to bring some of that to your home through our yard care service. At Lawn Love we are all about keeping things simple and consider it to be our sole mission. Our great customer service combined with our free two-minute quotes make us feel confident that you'll really dig the results. We have some of the very best independent lawn pros in the business who have an average of 10 years of experience, and have the skills needed to perform different yard care tasks such as lawn mowing, lawn aeration, gutter cleaning, and gardening. We are bringing some modern day touch to the yard care industry and with our affordable rates we'll be more than happy to bring some of our Lawn Love magic right into your home. 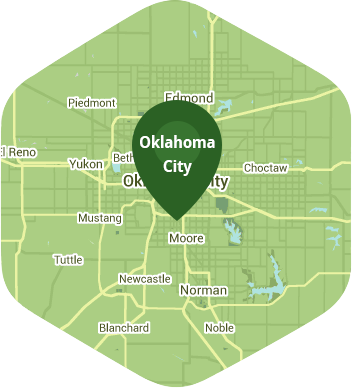 Get in touch with us by calling 405-926-8318 or by grabbing a free quick quote online. Rated 4.75 / 5 stars in 3,720 Oklahoma City customer reviews. Dusk and dawn are the best times to water your lawn (the sun will rise at 6:46 AM and set at 8:10 PM today in Oklahoma City). Here are some average lawn care prices for homes in Oklahoma City. Average lawn size 5,323 sq. ft.